Pets leave their mark, shedding hair throughout the home. Keep it clean with tips for removing pet hair from floors, furniture and clothes! We all love our pet companions, and most of us consider our dogs and cats part of the family. Pets require affection, attention and care, but even with regular grooming and brushing they can leave hair on clothes, carpeting and floors, upholstery and other surfaces. To get rid of pet hair, regular cleaning is a must and there are some easy ways to remove it. 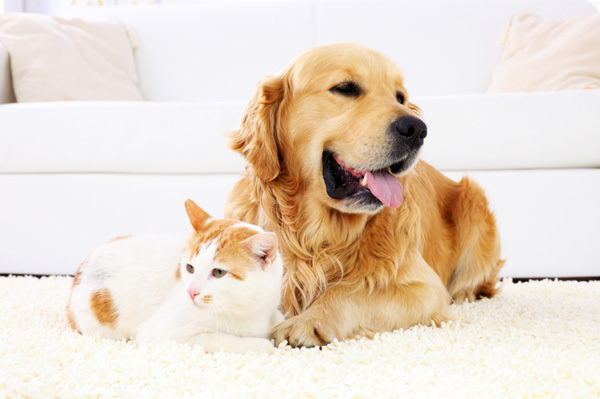 A regular and thorough vacuuming is the best way to remove pet hair from your home. Start high and work low, using proper attachments to run the vacuum over walls, into corners and over draperies and window sills. Static electricity and low humidity in a home can help pet hair cling to surfaces. Running a humidifier is good for you and makes breathing easier, skin feel more hydrated and it helps keep tufts of loose pet hair from clinging to surfaces. If you have a pet, keep a schedule of regular vacuuming to maintain a home free of pet hair. After a thorough cleaning with the vacuum, use a barely dampened mop or clean sponge on low-pile carpets. Keep the mop or sponge just for this one use. The mop/sponge will pick up any animal hair that your vacuum cleaner missed. In homes where pets shed a lot, sprinkle a very light coat of baking soda over the carpet before you vacuum. This helps to loosen the hair and makes it easier to pick up. You can also spray a light mist of fabric softener diluted with water over the carpet pre-vacuuming. It’s important not to drench the carpet — just spray lightly to dampen. The fabric softener loosens the hair and gets rid of the static electricity that holds the hair against the carpet fibers. Use that damp sponge technique on upholstery and it will roll up the hair for easy pick-up. Anything made of rubber also picks up hair, thanks to static electricity attracting it to rubber’s surface. Rubber gloves or even a blown-up balloon will gather hair from upholstery and fabrics when you rub them over the surface. Fabric softener sheets are great for a quick pick-up. Rub them over the surface of furniture, floors and fabrics to gather loose hairs. Velcro strips also work effectively. Always keep your floors clutter-free so there are less places for pet hair to gather and hide! Hanging up clothes helps keep them fuzz-free, and washing throw rugs and linens that your pet has contact with also prevents build-up of hair. Keep a lint roller or roll of tape to run over clothing when necessary.